Location is everything. Stay close to the action in one of New York Citys flashiest neighborhoods. When the heart of the action is always just steps away, you wont need to go far to find a popular restaurant, theater, or gallery.In addition to ideal surroundings, the Four Points by Sheraton Midtown - Times Square offers simple, uncluttered design in each of our 244 guest rooms plus every room in the house is non-smoking, to keep our air a little clearer. Behind our sleek design is the same casual comfort and service youve come to expect from a Four Points by Sheraton hotel.Little things in life make a big difference. Like our Simple Pleasures(SM). Get a great nights sleep in a Four Points signature bed, refresh with free bottled water daily, and keep in touch with free wireless High Speed Internet Access. Kick back with a beer from our collection of the worlds Best Brews or catch up on some reading over a hot and fresh cup of Royal Cup Coffee. We understand. The best comforts in life arent complicated. Welcome to Times Square, the Crossroads of the World. Home to world class Broadway shows, ticker tape parades, larger-than-life electronic billboards and the famous New Year's Eve ball drop, Times Square captures the heartbeat of this vibrant cosmopolitan city. Enjoying a remarkable renaissance since the year 2000, the 22 landmark theaters on the Great White Way have been restored to former glory, museums like Madame Tussaud's have opened their doors, new star-studded dining options can be found on Restaurant Row, and the shopping and entertainment possibilities are simply endless. 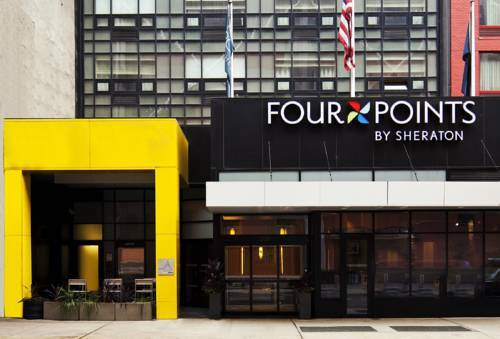 The Four Points by Sheraton Midtown - Times Square is within easy reach of all these sights and sounds, while convenient public transportation options can whisk you north to Central Park and the surrounding Metropolitan Museum, Guggenheim Museum, or the Natural History Museum, to name just a few. Or head south to the charming cobblestone streets of Greenwich Village, the vivid art galleries of West Chelsea or the deluxe boutiques in the reinvented Meatpacking District. Much closer to home, guests can explore all 200,000 square feet of the E Walk entertainment/retail complex. Here you can enjoy shopping, dining, 13 Regal movie theatres, the New Amsterdam Theatre, ESPN Zone, ABC, MTV and so much more! For the avid sports fan, Madison Square Garden home to the New York Knicks, New York Liberty and the New York Rangers is just a few minutes walk away, while Meadowlands Stadium is easily reached with direct bus service from Port Authority. Also ideal for conference and tradeshow participants, The Four Points by Sheraton Midtown - Times Square is the blocks away from the Jacob Javits Convention Center. Gotham Bistro serves American cuisine and classic comfort food, which are enhanced by our chef s seasonal specialties. The Sky Room is a trendy cosmopolitan lounge that offers sweeping skyline views from our 34th-floor rooftop.